Preheat the oven to about 170°C. Melt the butter and golden syrup on the stove. When the butter/syrup has melted, dissolve the bicarbonate in boiling water. Add the (still fizzing) mix to the butter. It should pretty much do what honeycomb does and froth up. Though, it technically doesn’t matter if it doesn’t, but ideally that is what you’re going for. Then just add the dry ingredients to the wet, and stir until thoroughly mixed. You can use a teaspoon or so to dole out portions, depending on what size you want. Flatten with the spoon or a fork. Then bake them at 170°C for 10-15 minutes, until they are golden brown. The time varies on how crunchy or chewy you want them. 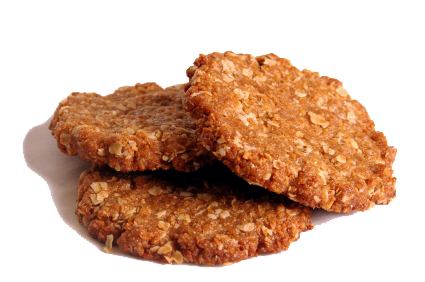 This entry was posted on 04/04/2012 by G in Cultures, Recipes and tagged ANZAC, Australia, biscuit, recipe, snack.